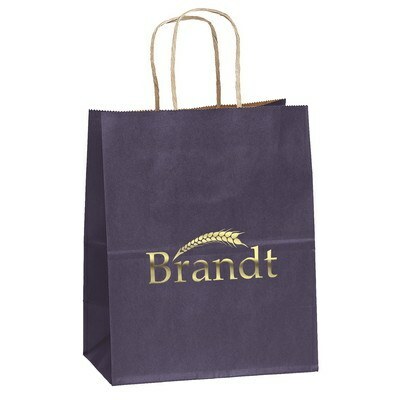 This custom logo munchkin paper bag - foil hot stamped features twisted Kraft paper handles. 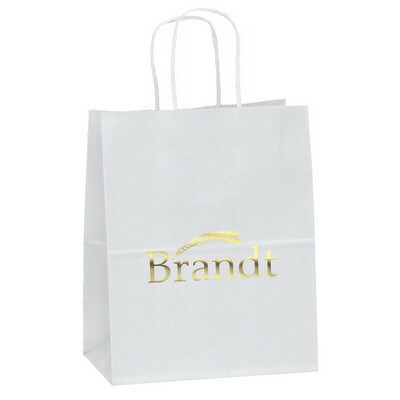 Use the munchkin paper bag - foil hot stamped to advertise your brand to children. This matte paper bag has a serrated cut top and twisted Kraft paper handles that make it easy to carry. It is 100% recyclable and affirms your commitment to the environment. Use Foil Hot Stamp process to imprint your company’s logo on these bags. Give them away at schools, shopping malls, child related workshops and seminars, and trade shows. Choose from several attractive colors and elegantly promote your brand far and wide.